From the moment I found a small, forgotten loom gathering dust in the corner of a studio while on Art Foundation at Camberwell College of Arts, I fell in love with weaving. I continued to weave and learn throughout my BA Textile Design at Central Saint Martins, immersed in the history, tradition, and romance of Britain’s oldest craft. 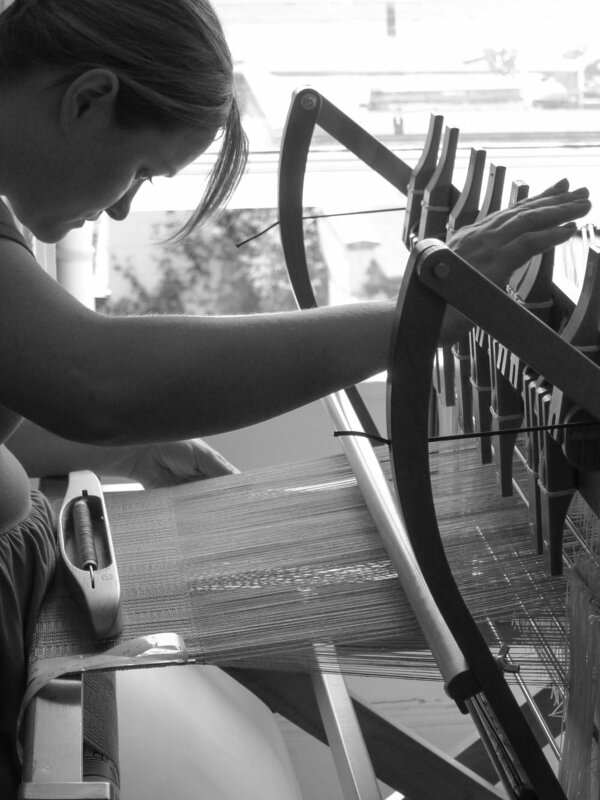 A career in weaving after graduating in 2004 seemed like a far-off dream, and I cut my teeth working in production for high street accessories brands. I worked with factories in the Far East and learnt about sourcing, the supply chain and, ultimately, how damaging modern mass production is for the environment. I know there is a better way, and armed with this experience, a further diploma from the Handweaver’s College, and a determination to create sustainable, low impact textiles that support British industry, I set up By Cecil in 2018. There is a demand among consumers for a return to more personal, hand-made, quality products and a move away from mass-produced, throwaway fashion. I want to create something that people will love, cherish and pass down. I want to create something that people will keep forever.